Priyanka Chopra Jonas’ brother Siddharth Chopra and his fiancé Ishittaa Kumar will soon be tying the knot. The pictures from the couple’s roka ceremony had surfaced online and social media buffs couldn’t stop gushing over it. Yesterday (April 10) it was National Siblings Day 2019 and the global icon has shared an adorable picture of her with Siddharth and mentioned that she cannot wait for his wedding with Ishittaa. National Siblings Day 2019: Sara Ali Khan Shares a Cute Throwback Pic With Brother Ibrahim Ali Khan! The picture that Priyanka Chopra Jonas has shared on Instagram is the one from Siddharth Chopra’s roka ceremony. She captioned, “This guy here is amazing.. full of life and ideas. My baby brother @siddharthchopra89 . Ure getting married to the beautiful @ishittaakumar and I can’t wait! I love you.. #happysiblingday @siddharthchopra89”. The date of Siddharth and Ishittaa’s marriage is yet to be announced. The roka ceremony of the duo had taken place on February 27 at the Taj Palace Hotel in New Delhi. 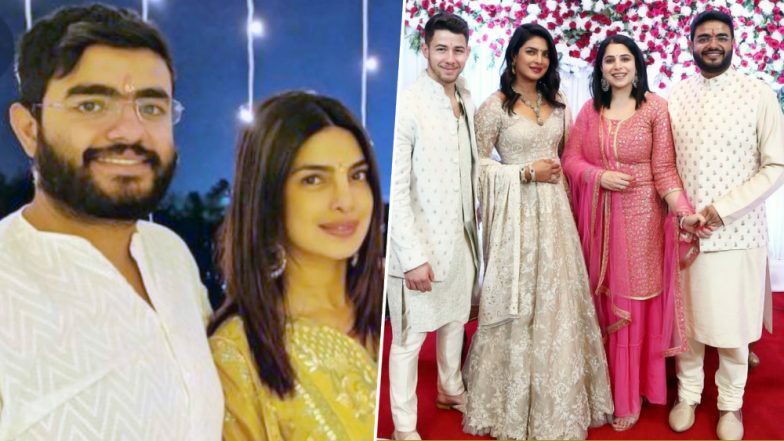 Priyanka Chopra Jonas and Nick Jonas Are All Smiles at Siddharth Chopra-Ishita Kumar’s Roka Ceremony – See Pics. Priyanka Chopra tied the knot with Nick Jonas in December last year. It was indeed a royal affair attended by the couple’s family members, near and dear ones, and of course their closest friends. The wedding ceremony took place in both Hindu and Christian rites. We are sure, even Siddharth Chopra and Ishittaa Kumar’s wedding will be a lavish one.